Senyorita Lakwachera: Boracay Island favorite sights and places. Boracay Island favorite sights and places. The most majestic moment I had in Boracay was witnessing the sun settling at the back side of the famous Willy's Rock. I wasn't alone in enjoying this majestic view - there were a huge numbers of tourist on the shoreline with their cameras pointing to the majestic color of the sky painted by the rays of the sun as it performs its dramatic farewell. Now here is my own snapshot shot of the scene. Willys Rock - is a stone formation built with an altar, found in Boracay Staion 1. The water surrounding the rock is very clear compared to the once found in the other part of the island. The stone is not as attractive as the other volcanic works is - it is shaded with grey and is very dark piece lying on the white sand. But its dark color makes this rock special and an eye catcher since it is like a big magnificent mole in the porcelain face of the island. This place is one amongst the “must-visit" spot in the island that the tourists wouldn't want to miss and was also hailed as one of the most photographed spot in Boracay. And, now my little turn! I won't let this chance slip away with out me having a photo with it on the background :). One of the things I love doing most is dancing that is why I wished to be able to watch fire dancers in Boracay. I am lucky enough to catch one of their performances and they are incredibly good on what they are doing. To capture someone's dance is something really satisfying. This would always reminds me that I once had witness how fearless art is and see how these dancers were able to speak out the language of our souls loudly roaring in silence. These are not extra ordinary photo of fire dancers - these are just extra ordinary moments of Soul Dancers. 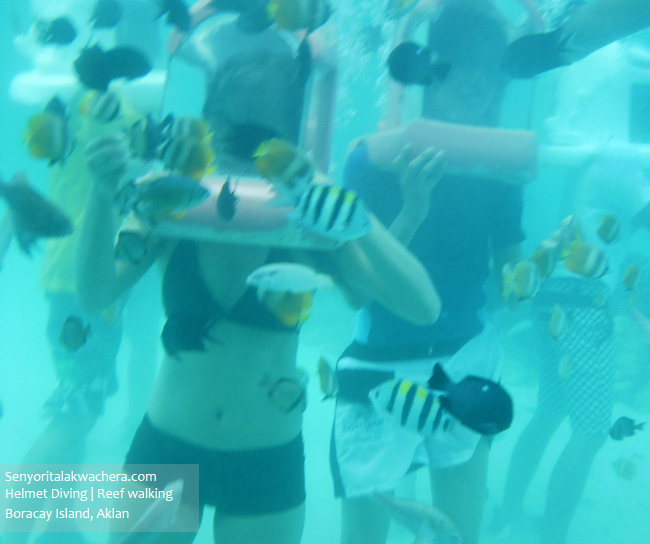 Boracay Helmet Diving or Reef walking is one of the most popular activity in a Boracay vacation. I preferred calling it the first because the last is a bit questionable to me – I am not sure though if I imagined reef walking right but can I just say sea bed walking? The reefs are bare to my eyes that time – hope that it’s just the way it is and not because it is part of the changes cause by commercialism that is slowly eating the natural beauty of the island. On the lighter side. Since I don’t have enough talent to do scuba diving where I will surely see a lot of reef I am looking for - I preferred an alternative way to get a closer interaction with the underwater creatures, okay that sound too much. Let me rephrase “to get a closer interaction with Nemo’s cousins and some reefs in the low part of the sea”. Well that is much closer since I know that this activity is nothing compared to what scuba divers experience which is also riskier. There is less danger 15 feet below that’s what they say, when the guide explained how we can do this entire thing I honestly find it something that can be done by anyone that knows how to follow instructions. But I honestly got second thoughts when two of the foreigners that went first backed off – the guide comforted us and said that the waves are a bit harsh and we need extra guts. Remembering that was the time when “bagyong sendong” hit the country. Jac went down first – and so I followed. As for me climbing down the ladder is the most challenging part but touching down and walking and feeding is easy breezy. Climbing down the ladder in stubborn current and tiny girl like me is quite tricky yet the different world under shifts all those doubts and pressures hence we stayed for over 20 minutes walking and feeding those little adorable fishes. This lovely and amazing experience is a part of Php3000.00 package for two enclosed with Island Hopping and ATV ride – this deffer on the number of pax, the season, and the way you juggle **winx**. This is one of the activities I can suggest you should try doing especially those who are a bit adventurer like me, those who doesn’t know how to swim yet want to take a sneak on whats in your way when you learn to be strong and swim further. I love this part right here – I love what I saw and I love the entire thing. Reminiscing makes me want to go back and have more of this. Reading had brought me to nook a sip on Boracay’s Real Coffee and Tea cafe which name has become an institution on the island due to the real and cozy coffee experience that is guaranteed for each cup and bite of muffin. It was established in 1996 by Ms. Lee Rosalia. They also serve continental breakfast, mostly omelets and sandwiches which are respectively priced. One of their best seller is the Calamansi Muffin, the recipe that took them to fame is very deserving of its tittle, a must try. Their place is a bit small and is in the middle of many other establishments in the area, so you may ask the locals for easy find.